I’m in love with gabions. At once both industrial chic and quaintly folksy, there’s something about that combined texture of stone and the sheen of metal mesh that really appeals. The other reason is they’re so DIY, as I’ve discovered since our first foray into gabion building a couple of years ago. When I realised I could build them as gabion walls at a fraction of the cost, it got me thinking about all sorts of ways you could use gabions in garden design. If you have access to local fill material (which can be any rubbish stone as long as its dimensions are bigger than the mesh openings), they’re cheap as chips to build, as the cages or mesh will only cost a few hundred dollars. 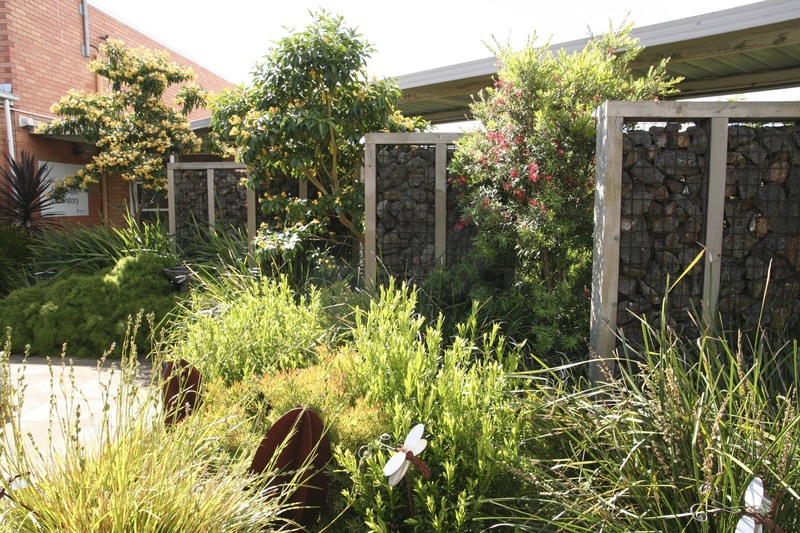 Gardens that reflect their local natural landscape have a genuine sense of place. Using your local stone, whether that’s sandstone, basalt, slate or granite will make it feel like it fits in with its surroundings. The stone can be either rounded boulders and large pebbles or angular broken stone but if you don’t have access to stone, or it’s not appropriate, you can also reuse broken concrete, old pavers, bricks and tiles for a more industrial aesthetic (and it stops them ending up in landfill). Whatever your fill material, the wall is very textured and dominating, saying very loudly ‘look at me’. Keep that in mind when choosing adjacent surfaces and plants, as smooth surfaces from large unit pavers, poured pavement, or lawn will look better than busy small unit pavers. Soft, weeping grasses or clipped plants are also a perfect counterbalance to the hardness of the stone. If the walls are low, than it’s the top of the wall that matters most, so keep that in mind when you’re packing the rocks, and save the best and most interesting pieces until last. 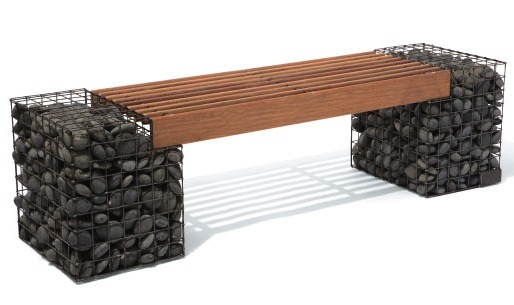 If you want to incorporate a seat, you can attach some outdoor blueboard to the top mesh panel and mortar pavers onto that, or add a backing piece underneath the top mesh panel onto which you can attach timber boards – or just add some thick seat cushions. A wall top can also incorporate succulents or epiphytic plants like bromeliads that will grow in bark chips, which you can hold in small pockets of geotextile. 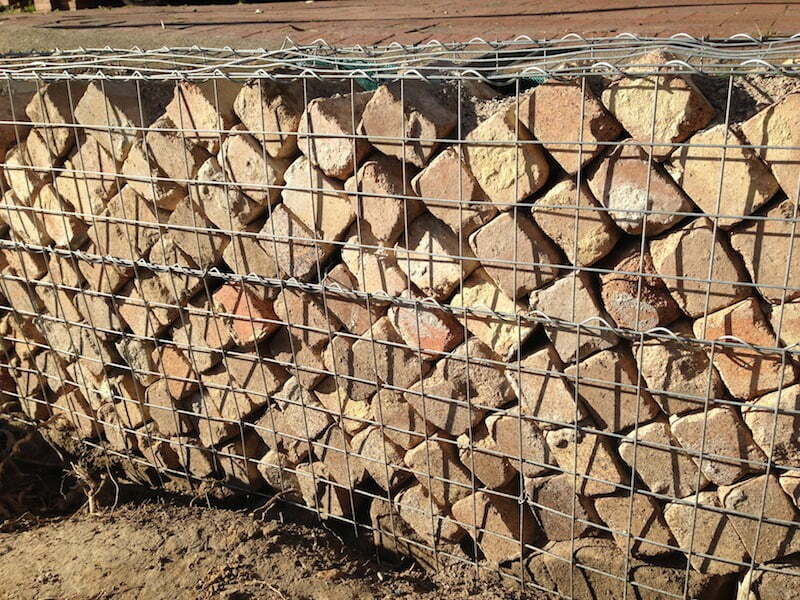 Gabion screens and fences need the rigidity of a surrounding frame of either timber or heavier metal. At eye height, the fill material becomes more critical and potentially more decorative, so you could introduce some subtle colour variations with bands of differently coloured stones but again it’s the texture that’s the most important element. While the screen can be opaque, why not incorporate some spyholes using old-style concrete breezeway blocks or a few terracotta pipes. By using smaller cages and finer mesh you can even create a sort of vertical mosaic of all sorts of objects, using shells and bleached driftwood for a beach look, brightly coloured plastic for retro kitsch, old wine bottles (ahh… remember the night we had that delicious Grange Hermitage……) or rusting metal objects for a steam-punk screen. 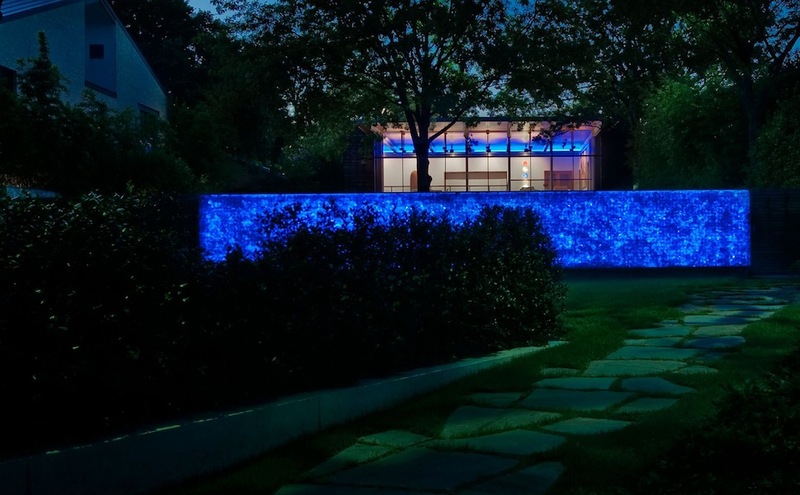 David Hocker of Hocker Design Group incorporated a gabion-style wall filled with blue slag glass in his ASLA 2010 Award winning garden, and installed internal lighting for an amazing ethereal glow. 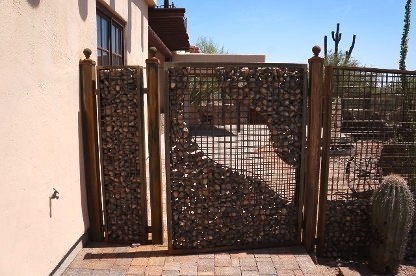 This ingenious gate design and construction by Goodman Fabrications, Arizona, makes a gabion gate light enough to swing by incorporating a self-contained internal open section. 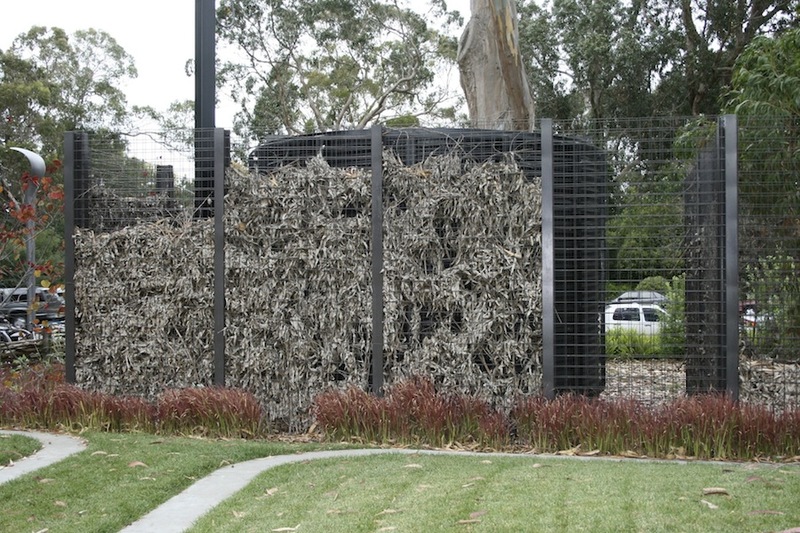 You could also use the gabion framework like a large vase to support dried willow, bamboo or reeds to form a light and lacy screen, or even just dried leaves and twigs like this screen at the De Young Museum. 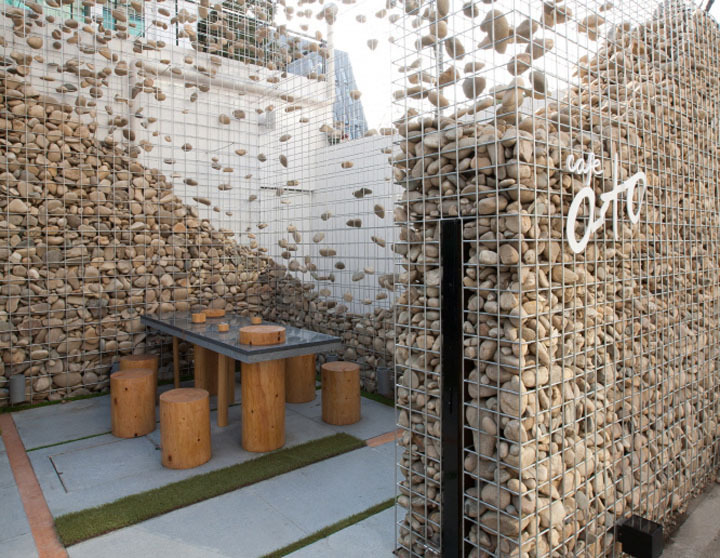 The Cafe Ato in Seoul, South Korea, designed by BONO, has one of the most innovative gabion screens around. The heavy solid mesh and rocks are transformed into something airy and light by ‘floating’ rocks, suspended within open mesh cages. Brilliantly beautiful. 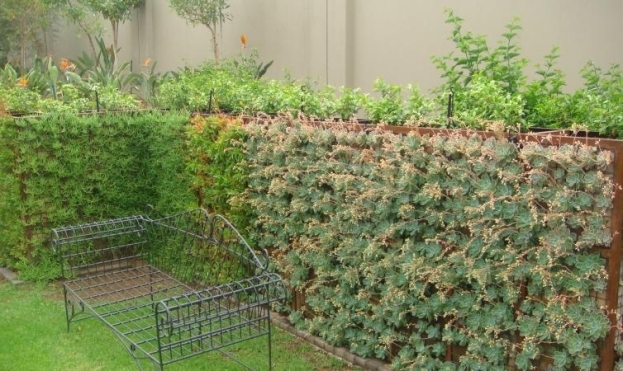 When they’re not retaining much, gabion cages can be as narrow as 20-30cm (8-12in), so you can use them to build a container for a small tree or large shrub. 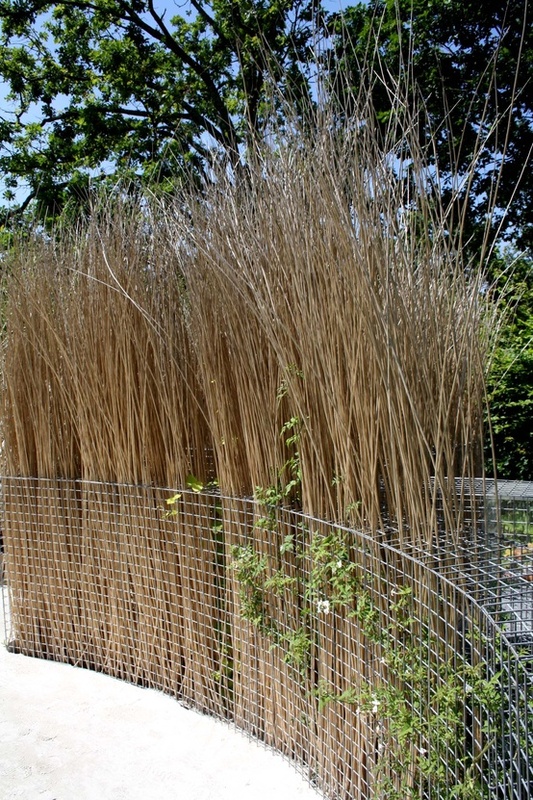 A geotextile fabric or weedmat behind the wall prevents potting mix from washing through. Roots won’t grow through the gabion wall as they are airpruned. 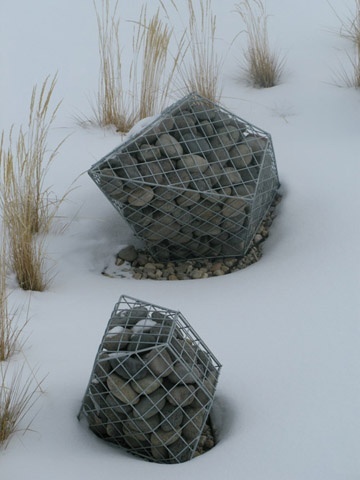 I love these squat pieces by sculptor Natalie Clark, based in Idaho, USA, and the way they lean over, seemingly past their centre of gravity, plus her tall gabion fountain which spills into an underground sump. Once you have the ability to cut and join mesh, the design possibilities are endless. Or how about a gabion labyrinth, like this one called ‘The Minotaur’ at Keilder Castle in Northumberland, UK, designed by Shona Kitchen and Nick Coombe. Using 200m of 2m high basalt-filled walls, it has some of the darker feelings of the original Greek myths, where labyrinths were a place of slow death. 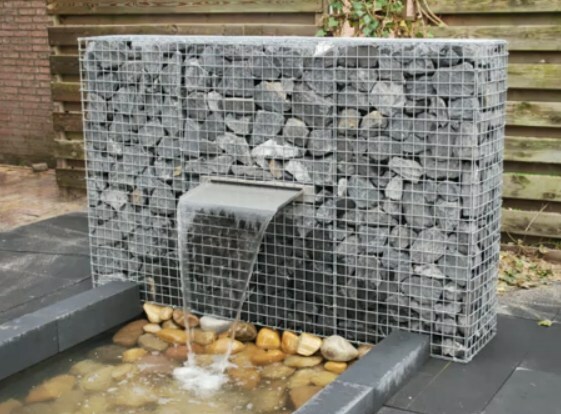 While dry stones are beautiful, many really come in to their own when glistening wet so a gabion fountain is a perfect way to achieve that in all weather. A submerged pump hidden in the bottom will also have its sound muffled by the surrounding rocks. 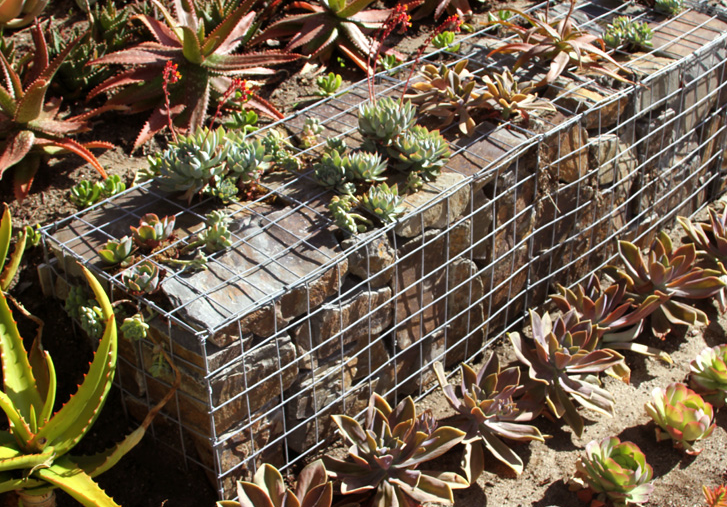 You can insert a blade spout into a gabion wall as in this example from Gabion Schanskorven or copper spouts, as used by the innovative Badec Bros Deco in Pretoria, SA. 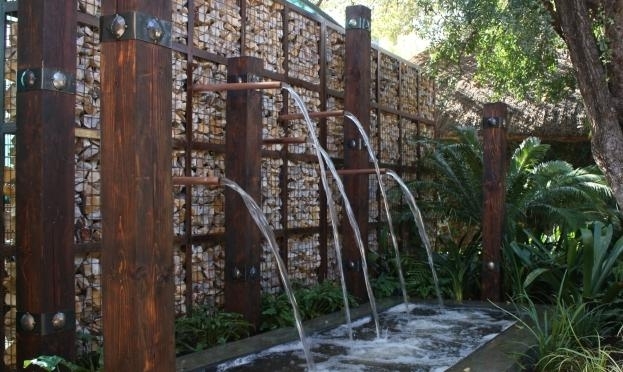 Use a lintel beam to build an archway water feature like the one by Ore Containers below. 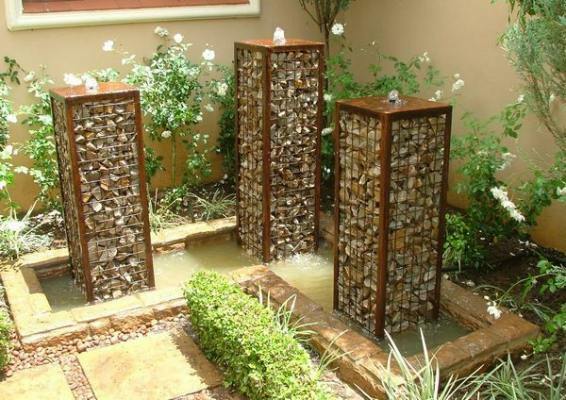 Gabion walls can also form the support for a pond liner. 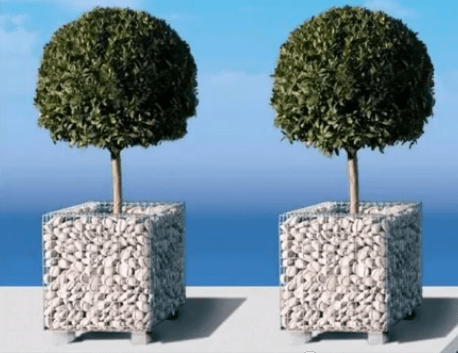 You can find even more stunning gabion ideas in this video from the Dutch company Gabion Schanskorven which includes gabion walls with fireplaces, letterboxes, waterfalls, tables, benches and planters. Update – just came across this very interesting gabion wall which has used old house bricks from the demolished house to make a small boundary retaining wall. Love the way they’ve been packed on the angle. Thanks for sharing these beautiful designs. I too am a great lover of gabions and only last week was admiring the ones used on the big spiral circular walk at The Armoury at Newington. Would love some in my garden! Why not just start out with a single cube somewhere in the garden, just as a texture contrast? Hi Joel, That’s a really great project. A lovely garden and such a good selection of photos showing the landscape and gabion build too. Thanks for sharing! I really like the repeated circles you’ve used in the design as well. Those pictures are really inspiring – I may eventually get the courage to give the seat a go. They look as though they would suit any garden style. Need to work out what I want to use as the filler and then really think that I will give it a try. Great pictures with so many different ideas. What’s your local rock? Or got any old concrete/bricks around? I’m filling my curved gabion with sandstone in the front and using broken up concrete retaining wall blocks (now surplus to requirements) as the back fill. But when looked at from the back right now, the concrete looks as interesting and beautiful as the real stone! I also fancied the idea of using some plastic poly pipe with a slot cut out of the top to let water in and putting it crossways through a gabion wall and filling it with some orchid mix to grow broms, orchids or other epiphytic plants out of each end so they spill out of the wall. Hmmm….? 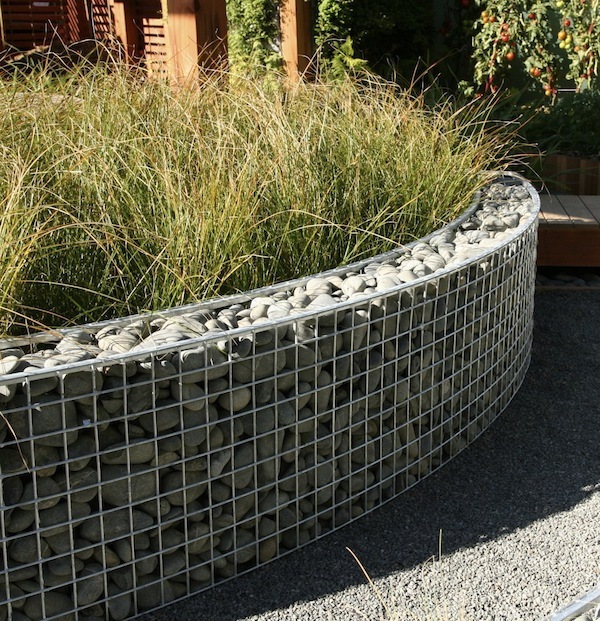 Aren’t these gabions fabulous? Love them…. inside and outside. What an ingenious means of holding stones together in a practical, sturdy and aesthetically pleasing way . And don’t stones and rocks change when they are stacked and clustered? Love the way design makes us rethink uses and looks of everyday items. What a glorious contrast to soft, feathery garden foliage, too. I think you’re right, Julie – there’s something about the look of soft grasses next to the hard angularity of the packed stone that just looks perfect. Each accentuates the other. 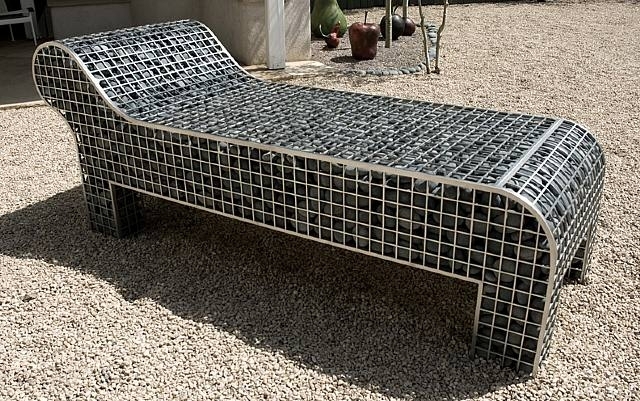 Hi Catherine, I was just researching gabion ideas for a client and came across this article that I’d somehow missed. Thanks so much for the article and the great pics. 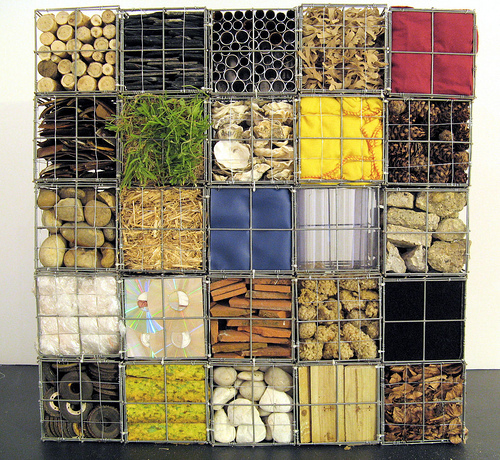 I love gabions too and to see them used in so many different ways… Very inspiring. Hi Catherine! 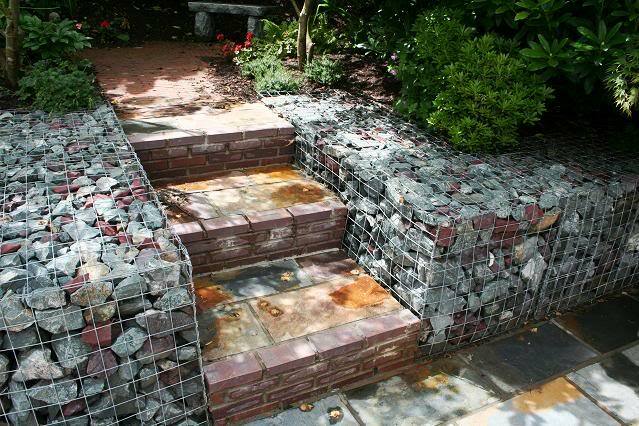 Thanks for all the gabion ideas you shared! Gabion is one of the user-friendliest building solutions. I love them. I work with them. Am really interested to see pictures of your curved gabion wall and any issues you encountered as want to embark on one this summer. Hi Perri – I’d look at using galfan mesh which includes aluminium in the mostly zinc coating, making it last much longer. Saline (coastal) environments are the worst but in your high humidity I think it would be wise. You can also order a ‘galfan plus’ mesh which has even more aluminium. Behind the wall you can use a geotextile fabric which should keep the clay soil out of the wall, which will help prevent rust issues. You also need to look at the subsoil drainage. If it’s very slow, although the wall itself should weep water, excess water might back up through the soil layers, causing waterlogging. You may need to install some ag pipe subsurface drains. I love that glow in the dark design ideas. Hi Catherine I like the way that you have shown how such a simple thing as a box of stones can be developed in a variety of very creative ways. I am putting together proposals for a natural swimming pool at our house which is in South West France, and have been wondering about using gabions to form the separation wall between the swimming zone and planting, or regeneration zones of the pool. The questions I have are, how would zinc or galfan coatings affect the water, which for planting reasons will be maintained around ph7. There will be no fish in the pool but there will obviously be people. The other option for protection of the gabion wire mesh is UPVC , as the gabions will permanently be under a minimum of 200mm of water I expect that the coating would not be affected by UV. I have the idea that the rocks in the gabions could possibly be used to support some aquatic plants any suggestions you might have on suitable plants would be welcome. Hmmm, some interesting questions there Peter which will take a bit of research I think. I’ll get back to you as soon as I can. 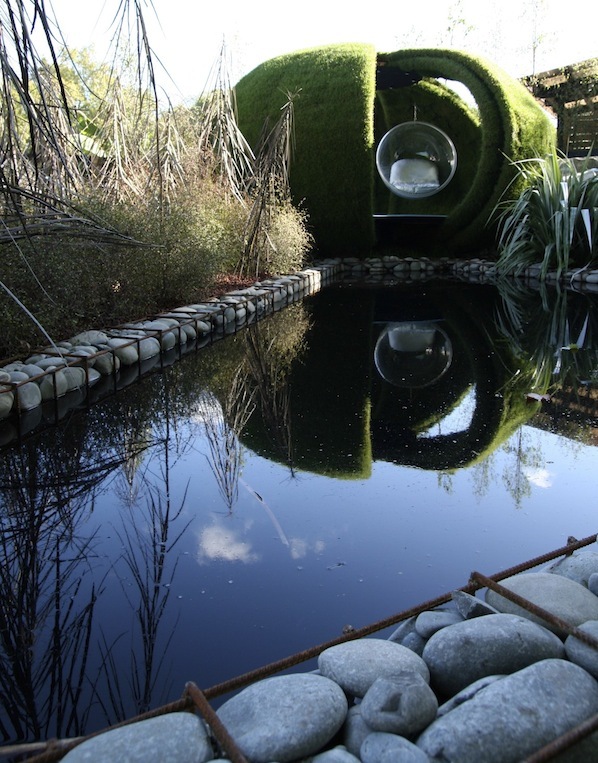 I am also investigating natural swimming pools and I have also thought of gabions as interior walls! I experimented this year with the Aquablox (RainXChange) being used here in the US as in-fill support for underground water storage tanks. However, instead of having the blocks be empty, I added some medium size stones. I had the thought that the stones would support algae and ammonia-eating bacteria. They worked beautifully in a small pond which had no pumps or electrically-supplied water movement. I plan to move forward with an 8′ wide by 30′ long swimming pond next year. Here in Texas, it will not have the shallow bog area because for us, that turns into an algae-filled mess. I will simply put a double-thick wall of the blox inside my liner and grow water plants in containers resting on the blox. Hope this gives you some ideas of your own! I would expect there would be some great applications for chicken coops/runs with these as well! Well, thank you very kindly Ash! Great site. 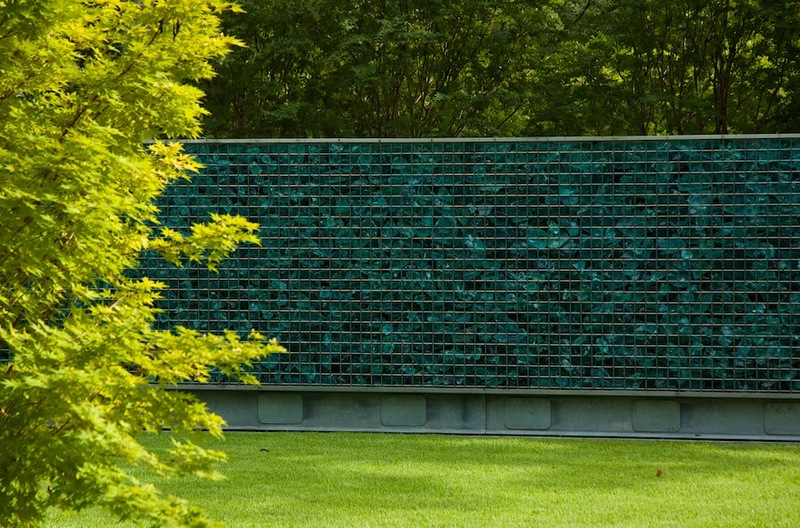 Just wondered where I could purchase glass slag for a gabion wall similar to the hocking wall. Live in Melbourne Australia. I would really like to read it and learn. Hi Marc, Yes, the curved gabion wall is finished – I just haven’t blogged about it yet as the yard all around it is still such a construction site (fixing drainage and changing path routes) that I didn’t have any great ‘money shots’ of it to publish. Didn’t want to turn people off! But as you’ve asked, I promise I’ll write it up next week. Thank you! Looking forward to reading and exploring what I can apply here in Sedona, AZ. My oh my! Great designs right there. Never thought gabions could be incorporated into so many structures. 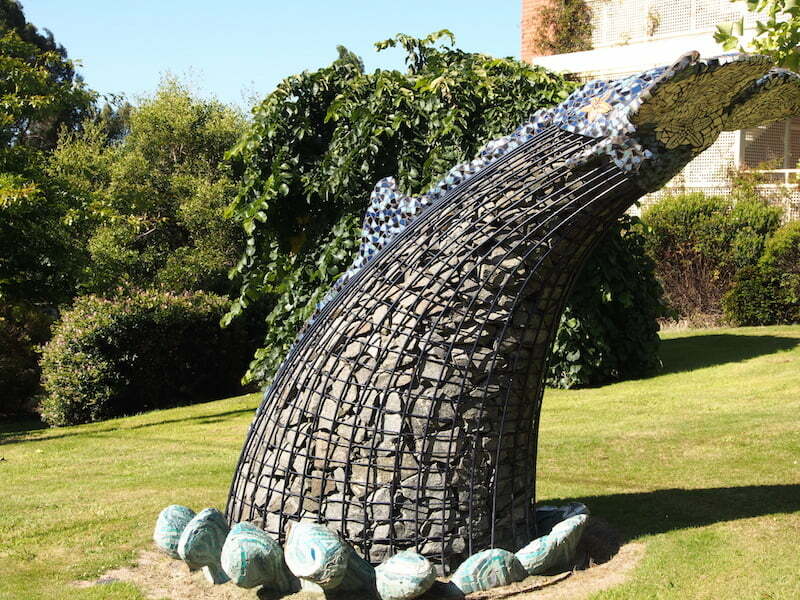 haha – maybe we need a competition for the most unusual thing made out of gabions. Kennel? Swimming pool? A boat? Beautiful article and pics. Inspiring. Will be tackling my front and side walls soon. Having sleepless nights creating great ideas in my head. 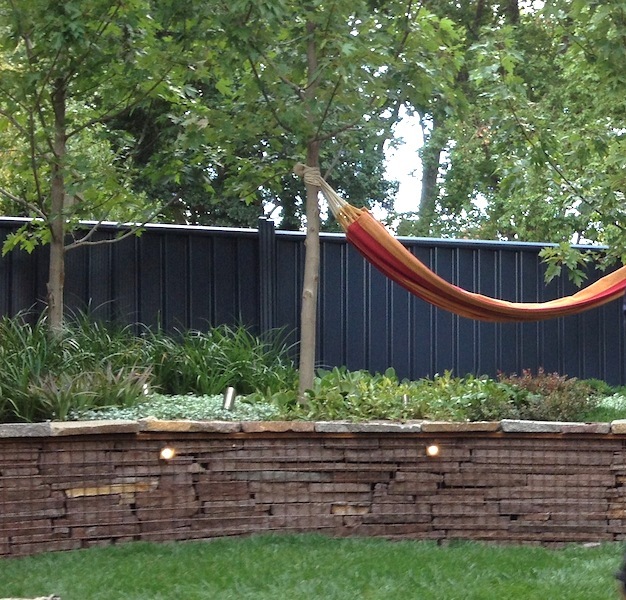 Also considering using gabions for entertainment area too – maybe too much / overkill? Too much? With gabions? Is it possible…..? As much as I love them, I think it is. We now have one long curved gabion (yes, yes I WILL blog about it soon) in the back garden and a smaller ‘echo’ wall across from it. I needed a longer wall there but decided all gabion would be too much, and so married the gabion (one overlocks the other) into a smooth-rendered, painted wall for a contrast. And it looks terrific. Greetings, Catherine, I was so happy to find your terrific site and this post in particular. 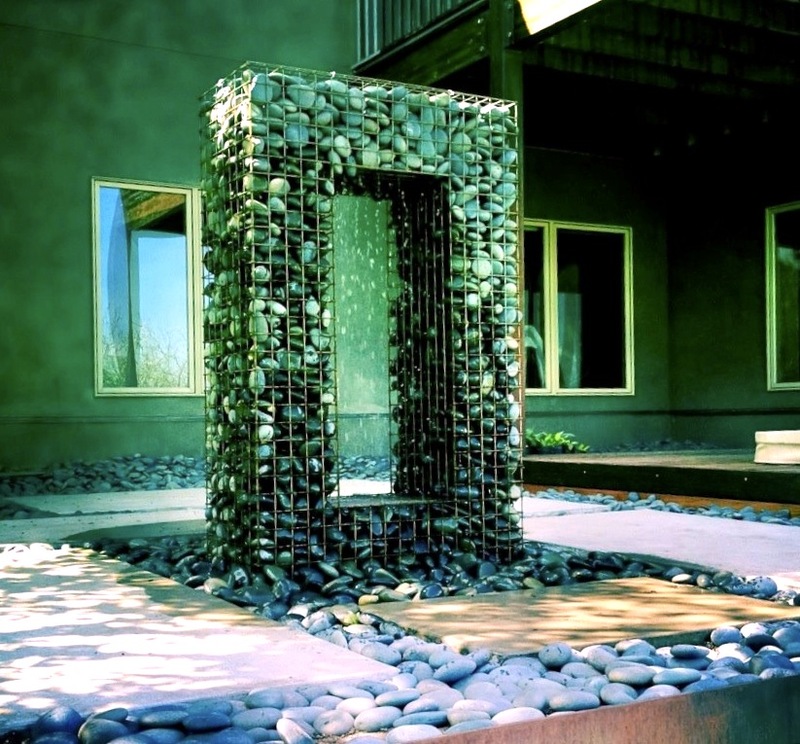 I have been interested in the great possibilities of gabions for a long time (since admiring at wall at an art museum where there were broken pieces of sculpture interspersed with the rocks in the front of the gabions). I finally have a project for which they would be a great fit (and give an old cracked patio a new life in a retaining wall). The design calls for a curved wall, so if you can post on your curved wall project, it would be greatly appreciated. Thanks again for such a great site. Oh dear I really am going to have to write this soon! The curved gabion walls have been finished for a while now but the path alongside and the garden are still not finished so I haven’t been able to take any really good-looking photos. Anyone with curved gabion construction experience ? Hi Discolizzy (I hope that means you love KC & the Sunshine Band as much as I do!) 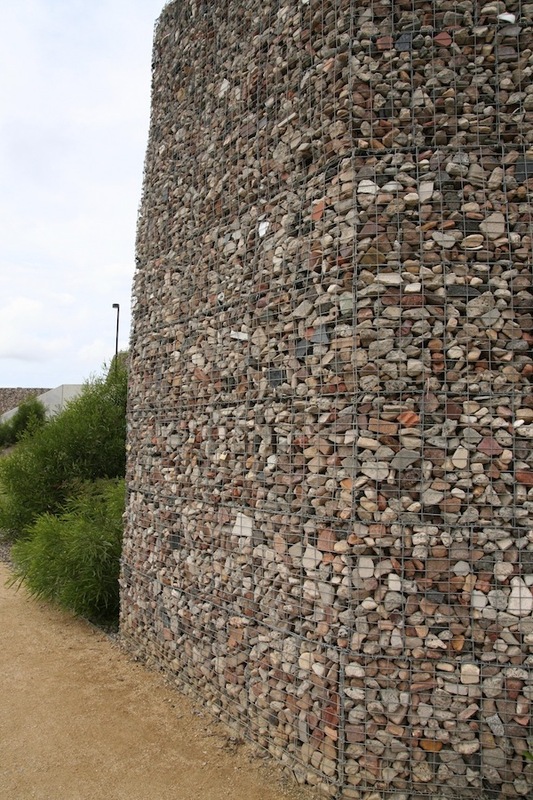 – If you read my post about how we built our curved gabion walls, you will see some more info there about using gabions as retaining walls. http://gardendrum.com/2015/04/14/how-to-build-a-curved-gabion-wall/ and also in this post about using stacked reused concrete as retaining walls. http://gardendrum.com/2013/03/04/how-to-build-a-reused-concrete-wall/ I can’t advise what would be needed on your specific site as it depends on the stability of the soil profile, how much rain you get, height of the walls etc. Any idea how to install gabion box underwater…Actually to be used as wave barrier (sea) and be installed from sea bed. Hi Melca, gosh that’s a very difficult question to ask a gardener who works on dry land! Not knowing where you are located, there is a contractor who works in Australia installing gabions for river and seawalls. http://www.prospectcontractors.com.au/river-seawalls so you could contact them for more information. They use PVC coated wire however other websites claim that PVC coated wire breaks down quickly from the push-pull of repeated wave action on the wire baskets. I am wondering if anyone knows what material was used to make the wall in the picture fourth from the top “Design by Carl Pickens…” I’m looking for something like that. Hi Josh – do you mean the pebbles or the gabion mesh? The pebbles are graywacke/greywacke, which means they are hard grey sandstone, often with whitish quartz grains and seams through them. They are quite common in New Zealand where this picture was taken. Thanks Catherine! I was actually talking about the mesh with the thick trim at the top. Was that part of the original mesh or was it welded on after the fact? Thanks for the information Catherine! I try construct a wall in my house with a gabion, but in only one basket. But, How is the best way? I think make “prisms” (baskets) of 1 x 0.60 x 0.10 m for example and then assemble them, with 9 of them would have my wall of 3 x 1.80 x 0.10 are you think is it possibel? With that measure the wire will not give way and the stones will be hold? The wire I bought is 2mm… Any ideas are appreciated! Hello Marcelo – you need to read my 2 other posts on building gabion walls – How to Build a Gabion Wall, and How to Build a CURVED Gabion Wall. Unfortunately, 2mm mesh is never going to be strong enough to build a gabion wall. You need at least 4mm mesh, smaller baskets and lots of cross bracing. And I would never build a gabion wall 1800 high without using engineering drawings as, if it collapses, it could easily injure or even kill someone.